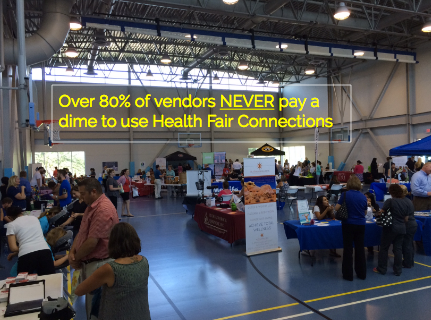 Health Fair Connections | Does HFC charge vendors? Health Fair Connections (HFC) is nothing like other health fair companies. So, the vendors in highly competitive categories or vendors who just want to stand out can do so by selecting a premium ad. It can be said that these vendors are more trusted, as they've gone through several steps to verify their information. We are hopefully soon going to offer vendors a subscription on HFC to where some can have a premium profile that allows them to manage reviews, be moved to the top of the vendor list in the vendor directory, have an invite button on their profile (click it and they're in), and showcase any offerings they have. 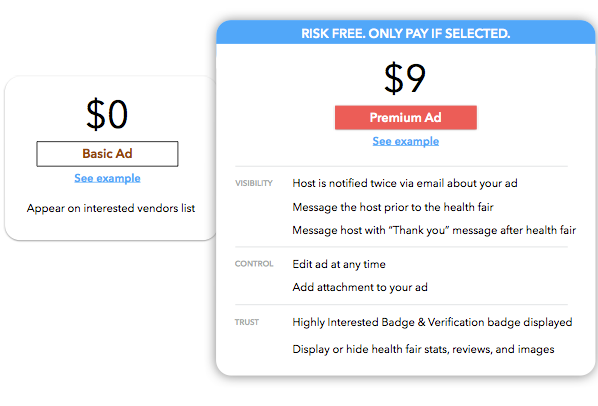 With the subscription, vendors also are able to express premium interest (have premium ads) unlimited times in health fairs. This isn't set in stone, but we wanted to let you know where we're headed.